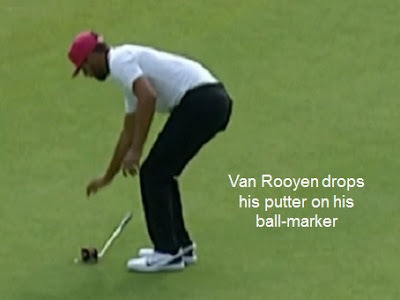 The penalty for a player causing their ball or ball-marker to move on the putting green, whether accidentally or purposely, was the same as for anywhere else on the course; a penalty of one stroke and the ball had to be replaced under Rule 18-2. An exception to this was if the movement occurred as a result of the specific act of marking the position of or lifting the ball (Rule 20-1). The R&A and the USGA introduced a new Local Rule to the Rules of Golf that eliminated any penalty when a ball or ball-marker was accidentally moved on the putting green. This Local Rule was adopted by the R&A and the USGA in all of their championships, qualifying competitions and international matches and they recommended that all Committees adopt the Local Rule, although it was not compulsory to do so, as it was not a Rule of Golf. The ruling would be the same as pre-2017, with a penalty of one stroke under Rule 18-2. • Place a ball-marker to mark that original spot. Probably the most (in)famous incident of a Pro golfer getting a penalty for accidentally moving his ball on the putting green was during the 1997 Australian PGA Championship at New South Wales Golf Club, when former Australian Pro golfer, Mike Clayton, twirled his putter in the air in frustration at missing a putt. You can view his golfing embarrassment by clicking on this YouTube link. Nearly There! I hope to be in a position to deliver my eBook, ‘666 Questions on the NEW Rules of Golf 2019” within the next couple of weeks. You can be one of the first to start absorbing the new Rules in the easiest way possible by adding your name to my growing pre-order list. Just email me at rules@barryrhodes.com. The target price is $12.99.